Babies are curious about the world around us. 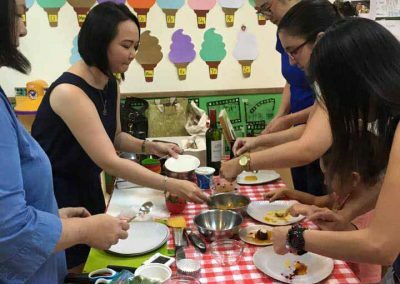 This class encourages cognitive, motor and social development through play and interaction with other babies, parents and teachers. 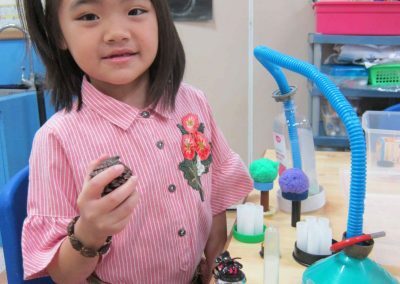 Activities include music and movement, fine motor exploration, and gross motor games. Please check with the school, we open Baby & Me Classes once we have a group of 3 babies. 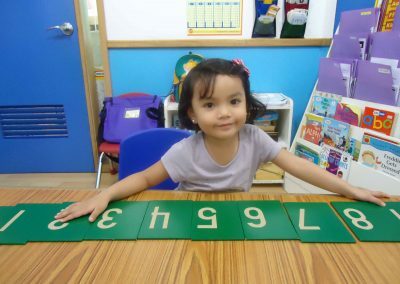 Our toddler programs focus on helping young children develop language and social skills. 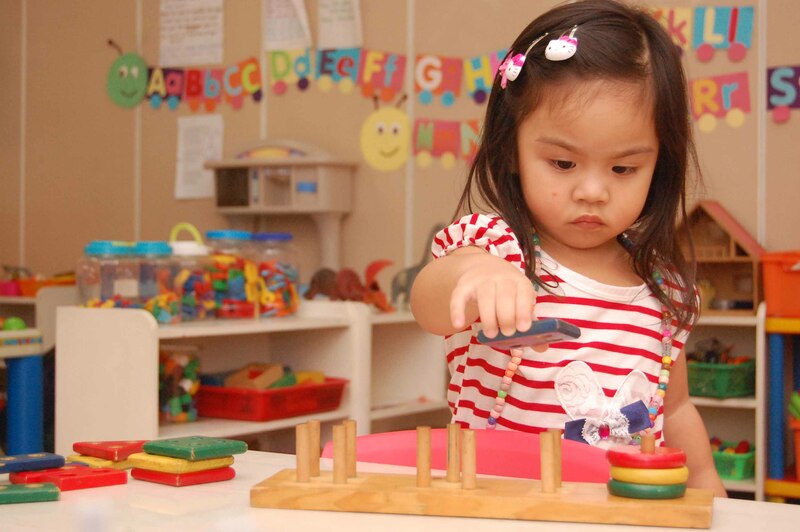 Sensorial explorations as well as play-based learning activities are essential parts in our Toddlers Curriculum. We have interesting monthly themes to increase vocabulary, play games, teach songs and read stories about – like home, body parts, animals, and transportation. 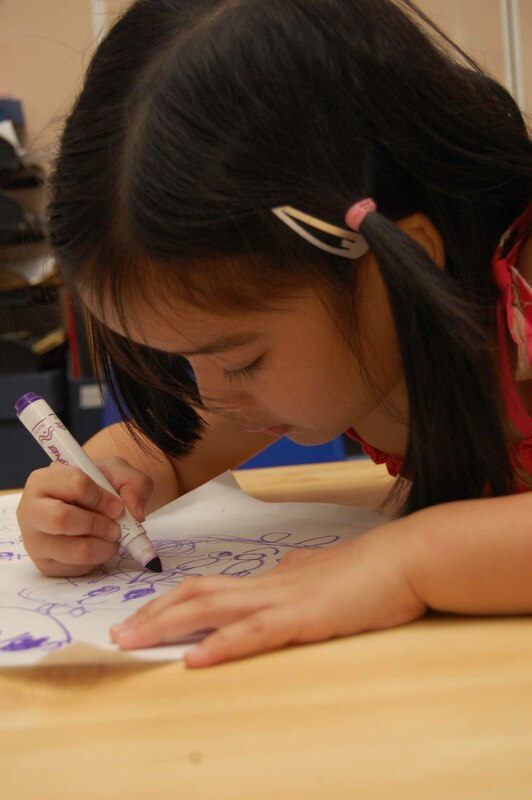 Our 3’s, 4’s and 5’s programs are designed to help children develop thinking skills and get them ready for big school. 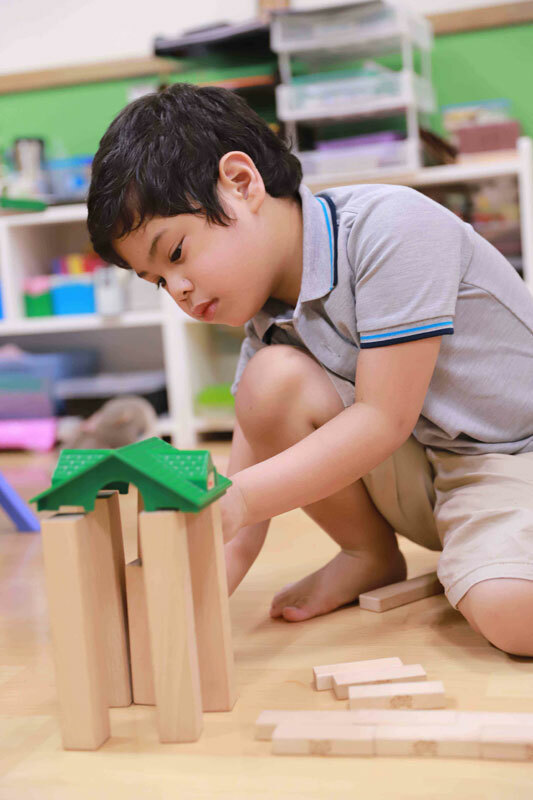 Children are introduced to basic math, science and literacy concepts through play centered activities, art explorations, group projects and experiments. Learning is best achieved when children are happy and feel secure and confident. 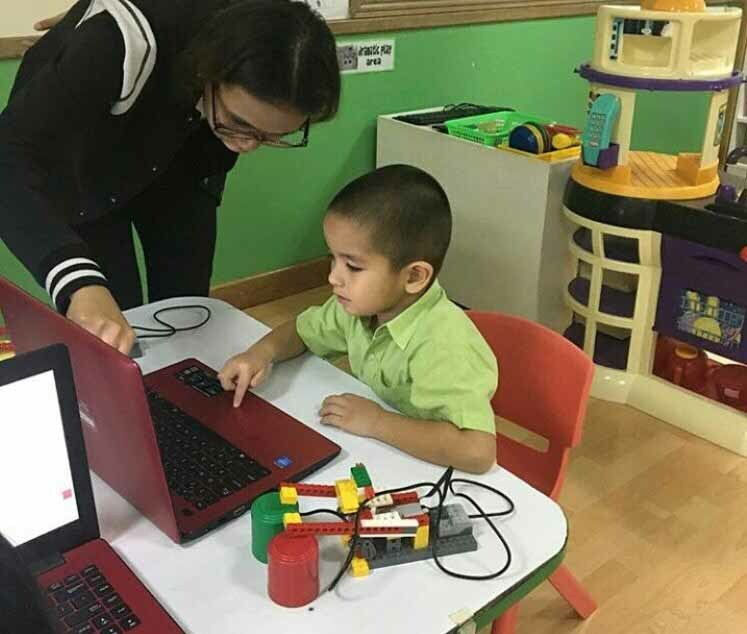 Children can learn about a variety of interesting topics like inventors, ancient civilizations, solar system, machines and dinosaurs in meaningful, engaging and memorable ways. 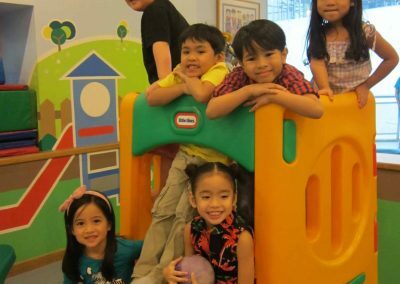 Free Play: Children explore the different learning centers and teachers encourage learning through play and socialization. This part of the routine offers children the opportunity to hone their skills in problem solving as well as lengthen their attention span. Circle Time: The whole class gathers for music and movement, to check attendance, do short games and have discussions or games related to the theme for the month. 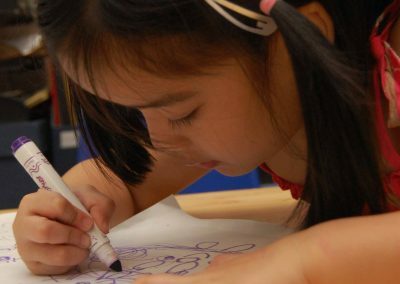 Art Time: Students are given different art activities each day of the week for creative expression and to develop fine motor skills. 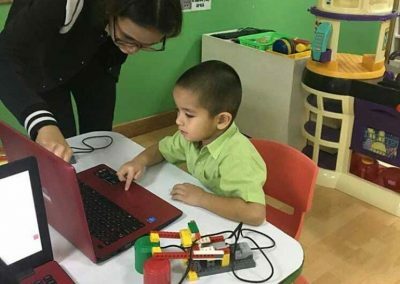 Writing Time: For our Nursery Level, Writing Time is done one-on-one with the teacher using the Handwriting Without Tears Program. For the Kinder Level students this time is to practice writing skills and story telling. Work Table: This is the time for Teacher-initiated activities to help children learn specific concepts in Literacy, Math and Science. 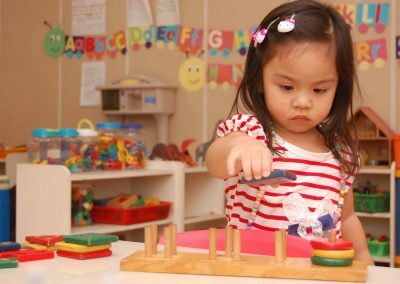 Table Activity: Students in the Nursery Level are invited to work on the table with materials prepared by the teacher and some materials chosen by the students. 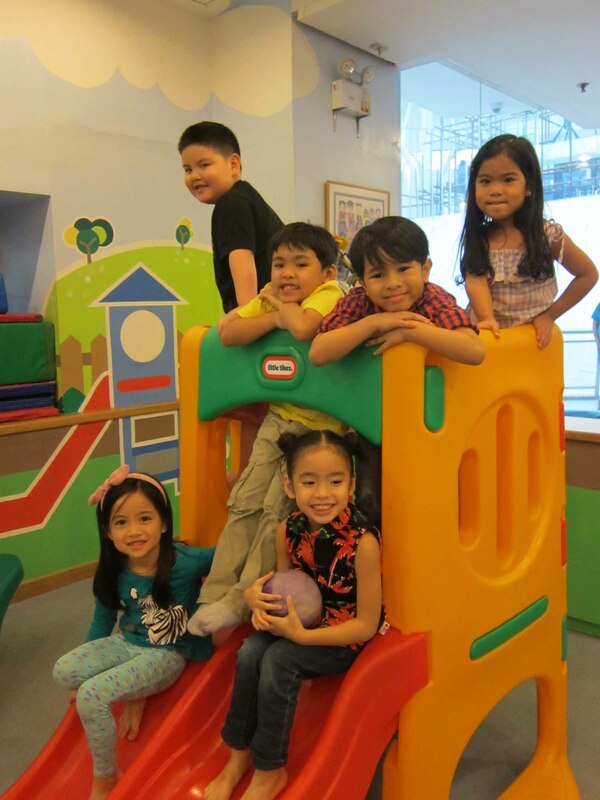 Romp Play: This is time in our indoor playground for active fun to develop gross motor and social skills. Story Time; Is the chance for the class to gather for a story read by the teacher, usually related to the topic of the week. In the Toddler and Pre Nursery Levels, we use books to help build the children’s vocabularies. 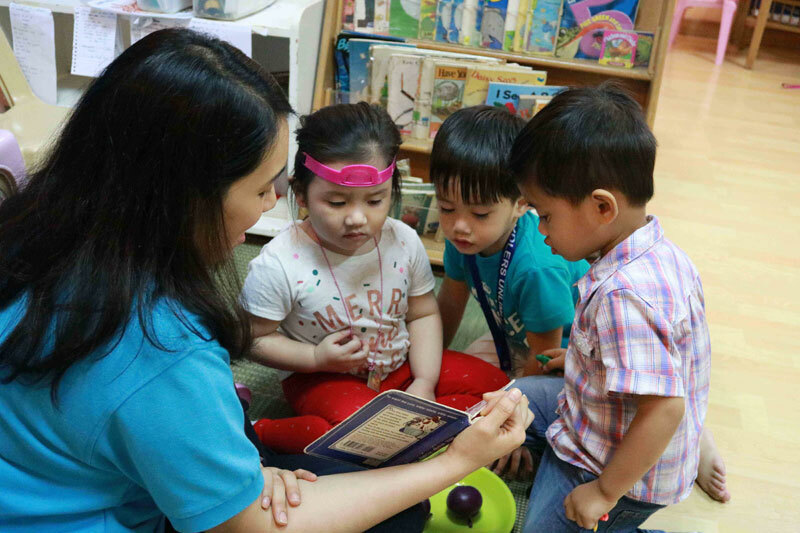 In the older levels, story time is used to build student’s for reading comprehension skills as well as love for reading and storytelling. Attendance Time: When students arrive in the Kinder Level Classes, they sign in and choose a task for the day (such as Weather Helper, Line Leader, Pack Away Police, etc.) This gives them a sense of responsibility in the classroom. 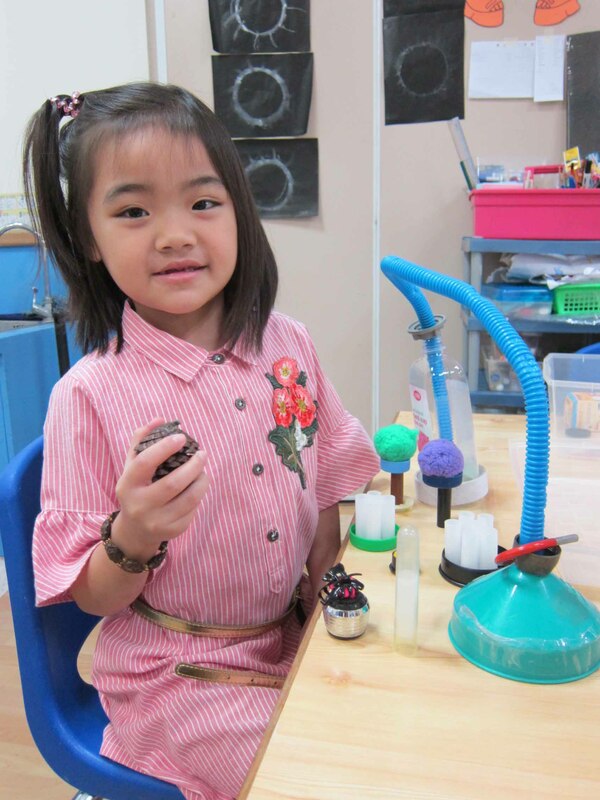 Centers Time: For the Kinder students, this is the time for self-selected activities to enjoy in the company of their peers. 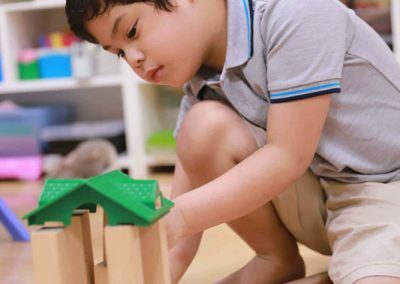 The teachers use this time to encourage children to use critical and creative thinking skills as they work with materials and play with others. 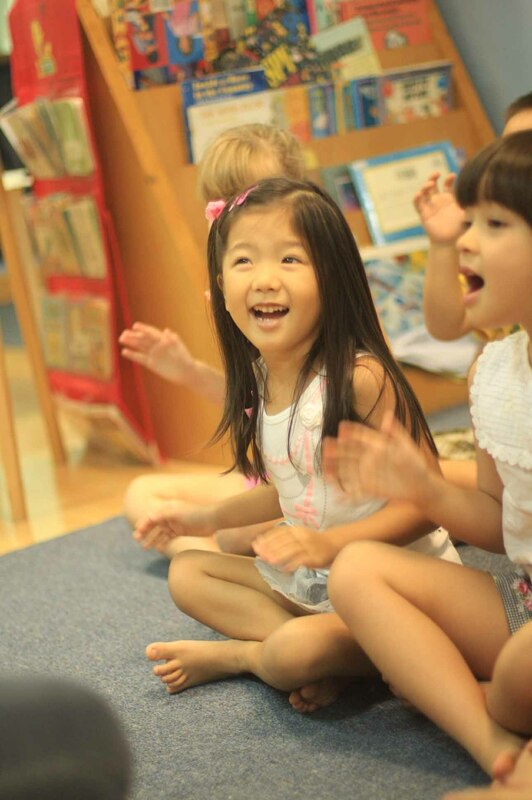 Circle Time 2: At our Kinder Level Classes, we have another whole group activity that is focused on games in Math and Literacy, as well as Creative Dramatics and Show and Tell activities. 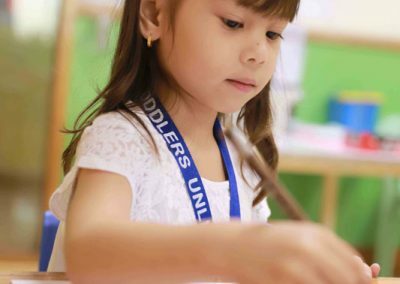 Work Room: For our Kinder 2 Level students, they are given 30-minute session each day to prepare them for Gradeschool work (includes Math, Language, Science and Filipino activities). We work on listening, focusing, participating, and collaborating in a group setting, as well as paper-and-pencil tasks. 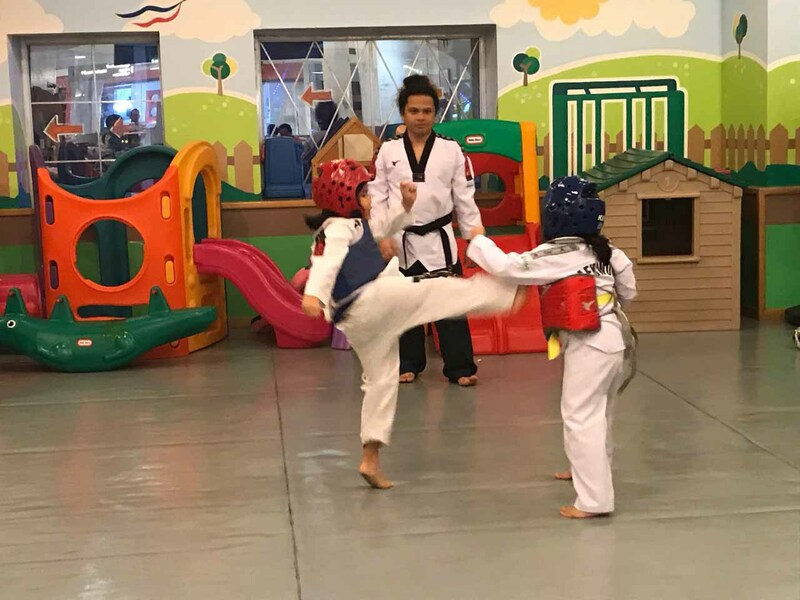 TAEKWONDO The Toddlers & Thinkers Sapphire Dragons is fortunate to have the Philippine National Team Coach Brix Darmo Ramos and his staff working with us. ENGINEERING FOR KIDS Engineering For Kids is a Science Technology Engineering Program developed in the US for children 4 years and up. Different workshops are offered in modules. 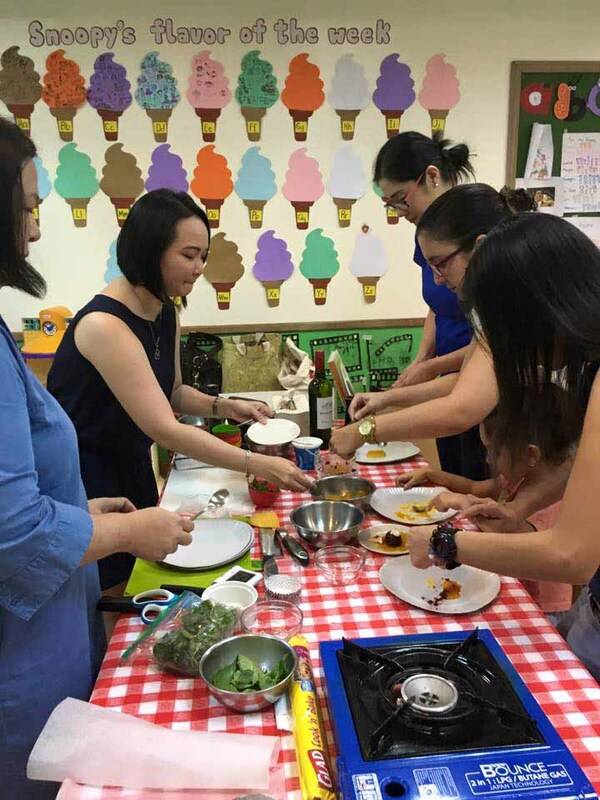 WORKSHOPS FOR PARENTS & CAREGIVERS We also offer workshops on a variety of topics. From first aid to discipline to literacy and play.